Speed and Precision. The two words echoed over and over from the test team. The new Helix is built for skiers looking for the ultimate blend of effortless speed and precise turns. The all new ski design rides higher in the water when compared to previous D3 models. Its agility and nimble feel from edge to edge are very easy to adapt to. The Helix delivers a feeling of absolute control in all aspects of the turn and through the wakes. 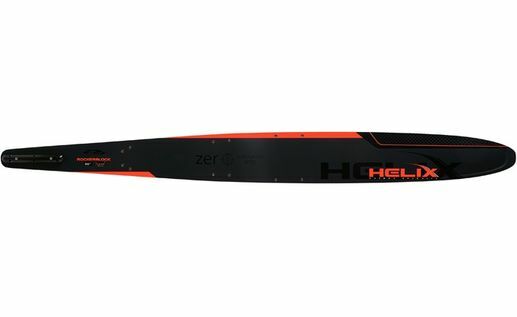 The smaller bevel design combined with a very precise control of water direction over the ski bottom create speed and instant acceleration that is apparent from the first turn. Edge pressure, when applied to the Helix results in instant acceleration. The reduction in effort is so dramatic the Helix reduces the impact a skier creates on the tow-boats speed control system. The less impact the skier creates on the speed control the easier it is for skiers to stay “connected” from buoy to buoy. The end result, effortless passes and bigger scores. The Helix is the complete slalom package. The Nomad, Z7, Fusion and now Helix designs are all focused on one goal - speed. Reducing the effort to make the ski accelerate is the design goal. All these skis started with smaller bevels and like to ride higher in the water. This design path has resulted in the production of the Helix. The most precise, effortless ski D3 has ever produced. The nimble feeling the Helix delivers results in quick turns that happen with minimal skier input. Minimal edge pressure results in instant acceleration.